New eBook readers are just popping up left and right, and today Aluratek Inc announced they shall be jumping on the eReader bandwagon as well. The company says it will be releasing an eReader, approriately titled, the Libre eBook Reader Pro with “exclusive LCD technology”. What makes the Libre eBook Reader Pro—we’re going to call it the Libre— slightly more celebration-worthy than the Kindle or the Nook? We think it could be its low price tag of $179. Aluratek says it is trying to provide the most affordable product in the eBook Reader category. The Libre features a 5-inch monochrome reflective LCD panel, a battery life with up to 24 hours of continuous use, as well as MP3 and photo support. The Libre also offers five font size options and also supports Adobe DRM, ePUB, PDF, FB2, TXT, Mobi, PRC and RTF formats, providing a wider access range for books and content. 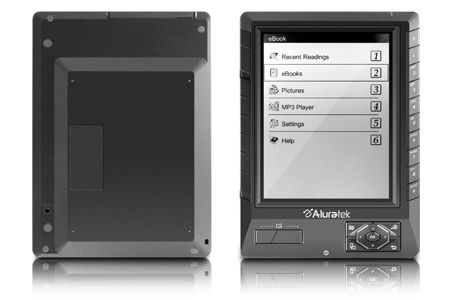 Aluratek’s new eBook Reader comes with a 2GB SD card, and supports SD and SDHC cards up to 32GB.